Emulator is the software that helps us to run multiple OS on a single hardware. It typically helps one OS to behave as another for as much amount of time as we want and then switch back to our original OS. This in turn helps people to run different apllications exclusively for various OS on a single platform. Like if you have an Windows PC emulator, or the iOS one, you can run Windows or iOS appliactions on your Mac computer, especially good for app developers. Mac PC is now common around the world, and it’s not surprising that some people would want to play game with it. But there are some games that only built for Windows, Nintendo or other devices, and hence you may need the game emulator for these games to run on Mac OS. So, here in this article, we will show you some of the best Game Console Emulators for macOS. Tips: If you ever lost important notes or messages on iPhone, you can also use Gihosoft iPhone Data Recovery for Mac to get them back easily even without backup. This emulator by Microsoft aims to emulate Windows OS on your Mac giveing you the freedom to run those programs specifical for Windows OS that you can not use on your Mac OS. This game emulator will successfully take out your worry about the fact that you cannot run your Windows games on Mac. This Windows emulator will work as Windows 7 version, which may be a bit outdated but still it can do your job perfectly. As the name suggests this is an XBOX oriented emulator completely made for Mac OS. For playing XBOX games, XeMu360 emulator is the most widely used emulator. This is comparatively a new software and it does support almost all XBOX games. This is a very powerful emulator so that Mac OS users can enjoy playing XBOX games on it flawlessly. PCSX-Reloaded is one of the the best emulator that can be installed on your Mac OS ideal for playing Playstation games. As an open source software, this emulator gives you the freedom to install it on all versions of Mac OS. Things become much simpler and easier after its installation process has been modified recently. It would be better to keep all your playstation games inside one folder on Mac. Then after installing PCSX-Reloaded all you have to do is to drop the game you want to play in it. The emulator also has a built-in BIOS and the ability to edit memory cards as well. Mupen64 is one of the well-known emulator for Nintendo 64 to use on Mac OS. This emulator is very stable and compatible with all types of Mac OS. However, you will require to install the GTK+ for this Nitendo 64 emulator to work smoothly. GTK+ is a graphical toolkit that needs to be installed on the Mac to process graphics. GTK+ will remains in the background and rightly handles the graphics of the N64 ROMS on Mac. Dolphin is one of the best game emulator for macOS to run GameCube, Wii and Triforce games. This emulator is very much compatible with multiple platforms including the macOS. It is also free to use as an open source project. The emulator works well with macOS 10.6 to 10.8 and is very user friendly as well. The only thing the user needs to do is to specifiy the BIOS file which comes always with the ROM. When you start playing the game, Dolphin emulator automatically senses the game file and starts playing it on Mac. OpenEmu emulator is one of the most reliable emulators in the market, compatible with Mac OS 10.7 and higher. Being very user friendly, it also has an iTunes type menu. 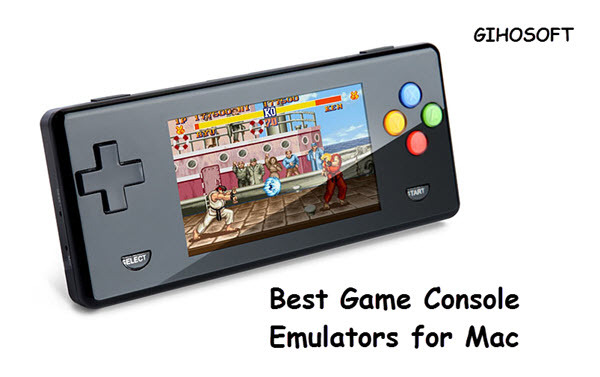 This is the ultimate gaming emulator that detects the game Roms according to their requirement. RetroArch seems to be an all-in-one emulator for macOS that helps the users to play any kind of retro games. The emulator even can be used to play PlayStation 1 games and older ones as well. In the handheld game console RetroArch even supports Game Boy Advance games. It is totally based on the number of cores with each of the core emulating a console. The name PPSSPP stands for Playstation Portable Simulator Suitable for Playing Portably, which is an emulator for playing PSP games. The emulator was originally created by Dolphin developers and is widely used across the globe. PPSSPP is very easy to install and to use on Mac, and also it supports a wide number of PSP games. This emulator is speifically designed for those people who like to play point-and-click games. SucmmVM is supported by macOS and uses the Scumm scripting language shown as its name. The emulator also supports many of the adventure games like the Monkey Island 1-3, Sam & Max and much more. DeSmuMe is another emulator for macOS that helps users to play with the dual screens of Nintendo, i.e. by simulating dual screens on the monitor itself. The emulator also supports games that we want play on the devices sideways. The best part of this emulator is that its constantly being modified by developers and new features are getting added to it on a regular basis. And now over the years this has become one of the best game emulators for Mac in the market. As the name suggests this emulator is purposefuly made for DOS based programs. Many DOS based games are still played by users; so to make those games available even on macOS this emulator has been created. This is an Android emulator that can be run on macOS so that you can play the millions of Android games onto your Mac. Xamarain Android player also supports OpenGL and actually virtualizes the device instead of simply emulating it. This also helps to enhance the performance of your Mac. The emulator has a great integration with both the Visual Studio and the Xamarin Studio, and this one has a native user interface. PS3 emulator typically supports macOS and allows users to play PlayStation 3 games on Mac. It is completely free and only need you to have any PS3 supported game. This gives complete freedom for users to choose whatever PS3 game they want to play on their Mac. As its name suggests, this is an emulator that helps you run iOS applications on your Mac. By downloading this simulator, users can use iPad applications on a Mac as well. The best iOS emulator currently available is the iPadian. This emulator is based on Adobe AIR and readily creates an interface similar to iPad on your Mac. iPadian is a very good emulator if you are just looking to run iOS appliactios and games on your Mac flawlessly. The Visual Boy Advance, also known to be the Mac Boy advance, can play almost all games of the Nintendo consoles on Mac. This GBA is written and developed specifically for the OS X and is compatibile with almost all kinds of macOS. So, here are our top 15 picks of game consloe emulators that you can readily download onto your Mac and seamlessly enjoy Android, DOS, Windows, iOS and much more experiences. By this way, you do not have to buy other kinds of OS, but just an emulator that will help you to run other applications on the single macOS. Each of these emulators for Mac has its own advantage, and gaming on them is another treat to be honest. With such wide variety of support for games, you can download each of them and find out your favorite one and play all along. If you have any other good suggestion or question, welcome to comment down.